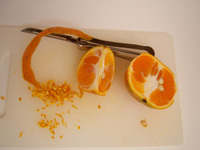 Use a peeler to take off 1/2 of the rind from your tangerine and mice finely. Combine, egg, milk, vanilla, oil, salt and minced rind to a shallow pan and whisk together. Then squeeze in the juice of 1/2 of the tangerine. Place slices of bread into liquid mixture to soak, turning after a few minutes to coat evenly. Start heating your pan on medium heat setting with a little oil. When pan is hot, place the slices of soaked bread on the pan. I use a cast iron stove top griddle… any griddle or large skillet will work fine. Cook until golden brown on each side. Serve while hot, top with butter, syrup and a sprinkle of powdered sugar. Enjoy! Tangerine and ground pepper? I’m intrigued and I’ll be trying this one. that uses orange marmalade that is out of this world! Mm, these sound great! Thanks for the recipe. I’m going to try it later this week, I think.